I've been making my own body scrubs for years now. 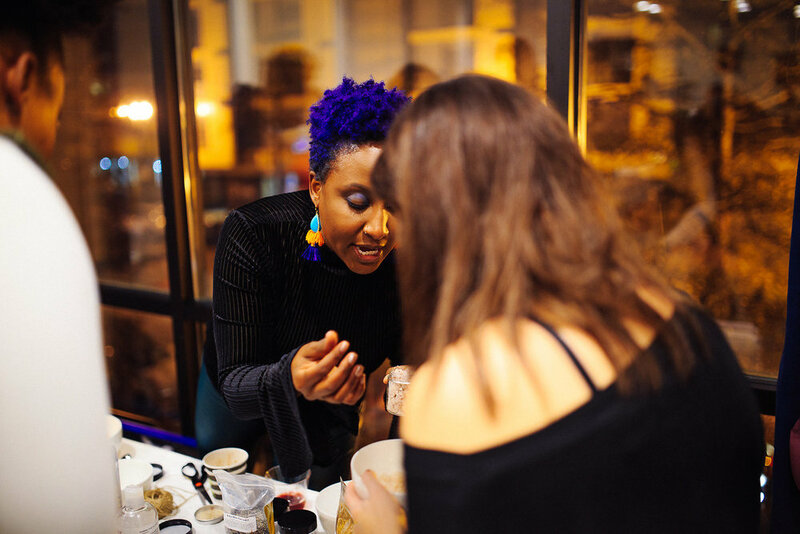 Its such an important part of my skincare routine and I knew it would be a really fun workshop at our Holiday Jam because they make great gifts for friends and family or for yourself. One thing that I noticed during this workshop is that folks wanted to know what my exact recipe is. The thing is I don't have one. I have the basics down but each time I make it a little bit different. So here is how I make my scrub. I fill my container with a blended Epsom or mineral salt. Why blended? Because most likely the salt will be much too coarse. So I pop it in my blender until it is a fine sand consistency. The fun part is creating the scent. Floral scents work really well with my body chemistry. and I am obsessed with Rose scented things. Attendees seemed to enjoy this part the most too. They came up with some delicious flavor. Some ended up making bath soaks with Epsom, pink Heilayin salt, and their favorite scent, which you can do at home, the only difference was they added about 2/3 less oil. I almost didn't have this event. But I am so glad that I did. The vibes were beyond. I made this backdrop from plastic netting and fabric and had to add these beautiful paper trees from West Elm. For the food. I decided to do a little color play with the fruit and veggies platter which I placed on a tray. A cheese platter with assorted crackers. Meatballs and Potatoes fondant. I really wanted to bring the colors from the backdrop onto the table. We eat with our eyes first so I am always mindful of how a spread looks. I also like to keep the snack food at the edges so that folks aren't reaching over the most substantial food. People tend to come back for second and thirds throughout the night! For cocktails, I made a spicy sorrel punch with cloves, cinnamon, ginger and rum and a batch of very strong spiked hot chocolate.